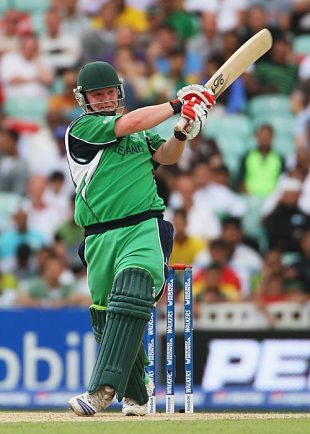 There have only been 12 higher scores in ODIs than Paul Stirling's 177 for Ireland against Canada in Toronto a couple of weeks ago, and none of them was made by a player from a non-Test nation (if we include two scores for Zimbabwe, who are not actually playing Tests at the moment). The previous-highest score by a batsman from an Associate member country was Kennedy Otieno's 144 for Kenya against Bangladesh in Nairobi in October 1997. This one defeated my limited database skills, but fortunately another Facebooker, Nev Johnson from Australia, was alert enough to work it out: Matt Poore passed 40 four times in his 14 Tests for New Zealand in the 1950s without ever quite making it to 50. He made 45 on his debut, against South Africa in Auckland in 1952-53, and also made 44 against South Africa in Cape Town the following season, 43 v Pakistan in Karachi in 1955-56, and 41 against South Africa in Port Elizabeth in 1953-54. In ODIs the record is also four, by Naimur Rahman of Bangladesh, whose highest scores in 29 one-day internationals were 47 (v Sri Lanka in Colombo in 1997), 46, 45, and 41. The story goes that one day in September 1939, some members in the Long Room at Lord's spotted a workman removing the bust of WG Grace that used to be on display there, intending to put it into safe storage. According to the member you've quoted, that could only mean one thing: the Second World War had started. The highest is a stand of 211 between Vinoo Mankad and Vijay Hazare for India at Lord's in 1952. Mankad, in irrepressible form, made 184 - just before he opened in this innings he had taken 5 for 196 in 73 overs when England batted - while Hazare was content to play second fiddle, eventually making 49 in almost four hours. In second place is a partnership of 192 between Denis Compton (278) and Trevor Bailey (36) for England against Pakistan at Trent Bridge in 1954. Then come two stands involving Brian Lara: when he scored 375 against England at St John's in 1993-94 he put on 183 with Keith Arthurton, who made 47, while in Adelaide in 2000-01 Jimmy Adams contributed 49 to their stand of 183 (Lara finished with 182). Left-arm spinner Pragyan Ojha's 50 wickets in the IPL puts him in second place on this particular list. On top is a rather quicker left-armer, Ojha's Deccan Chargers team-mate RP Singh, who has taken 51 wickets so far. Irfan Pathan has taken 47 wickets, Anil Kumble 45, and Shane Warne 44. The claim to fame of John Fagge, who played for Kent many years ago, arises from a match between Kent and "England" in Canterbury in 1844. In the first innings Fagge went in at No. 11 for Kent, and was bowled by William Clarke, an underarm bowler who became famous as the promoter of various "England XIs" that toured around England. In the second innings Fagge moved up to No. 3, coming in after Clarke dismissed Ned Wenman with the first ball. But Fagge fared no better, being bowled again by Clarke - who thus completed a hat-trick, including Fagge in both innings. This is believed to be unique in the annals of first-class cricket.